Are the Wings Like Last Year’s Stars? It seems that way, but to a lesser extent. I’m talking injury-wise rather than underacheiving-wise. When the Wings played the Bolts, the other day, Ohlund plowed Henrik Zetterberg, and now Hank’s out for today’s game. And that’s on top of the injuries to Jonathon Ericsson, Johan “Mule” Franzen, Valterri Filpulla, and others. But the Wings STILL find a way to win. I’ve always hated them for that. And I expect them to do the same today. 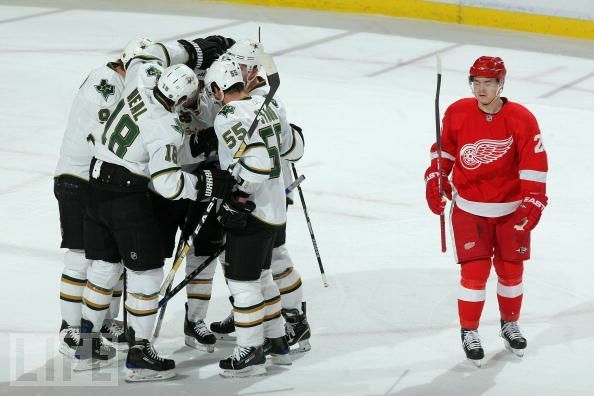 For one thing, the Stars aren’t the greatest in afternoon games, and this is the Red Wings we’re talking about. It’d be awesome if the Stars win, but I’m not really expecting them to. You never know, but i’m not really expecting something like that out of these Stars. And guess what? We get to see a new Star! Maxime Fortunus will make his debut today! Yay new Star! Best of luck to him. Obviously, the big story from last night is the no-goal that was. I’m biased, and I’ll always take the Stars’ side, but even I’ll admit that that was a goal. However, the way I see it is a make-up call from the hockey gods. Whether it was from the Calgary game or even way back in the Western Conference finals with that bad penalty call on Mark Fistric. So, that’s out of the way. There was nothing but good last night from the Stars. Even if that goal wasn’t waved off, they probably would have won. They played better than the Wings. The power play worked (2 PP goals), and they killed four penalties off. Alex Auld was amazing, and James Neal was awesome. Hopefully they can build off of that win and create a little win streak. Tonight: the Blue Jackets come to town. See you there. I feel like a traitor for rooting for the Red Wings over the Pens. The truth is, I used to hate them with a passion. But after watching these playoffs, I’ve found that I actually kinda like the Wings. Blame it on the comedic stylings of Pavel Datsyuk, a guy who has a great sense of humor that sounds even better with a Russian accent. However, I’ve stopped liking Sidney Crosby since the playoffs started. I’d always felt sorry for all the heat the Kid takes for diving and whining. I’d always though people made that stuff up to have a reason to hate him. But then, I saw him whine to the refs to make the crowd stop throwing hats for Ovechkin, and then I watched him dive left and right throughout these entire playoffs. I watched one game during the Carolina series, and I was completely disgusted with Sid’s fruitless attempts to draw calls. Another reason I like the Red Wings is that they’re usually ahead of us in the standings, so rooting for them won’t hurt our place much. Now, if we were battling a close race for first or something, then I’d go back into my “Detroit-loathing” mode. I’ve pretty much forgiven the Wings for beating us in the West finals last year. We won the season series 3-1, and that revenge felt really good. Beating Detroit just feels differnt than beating any other team. It puts me in a good mood for weeks and it just feels more rewarding. Embarrassing them at home by exposing their weak penalty kill was just plain awesome. Some wounds run pretty deep, but as long as I don’t think about the heartbreak of last spring, I don’t mind Detroit winning. Lastly, I’m only 14 and a half years old, so I want to see an actual hockey dynasty. I’m not old enough to remember the Oilers or the Islanders at the height of their greatness. It’d be cool to say in, like 20 years, “Hey remember when the Red Wings used to be really good?” By then, we’ll be talking about the Dallas Stars dynasty *wink, wink* and how awesome it is. Oh, and another reason I’m rooting for Detroit tonight is that I like Nicklas Lidstrom. You just can’t help but respect the guy, and I’d like to see him win a fifth Cup. Plus, he’d be the very first European-born captain to lead his team to back-to-back Cups. With that said, Go Wings!